What I loved about the book is that it wasn’t what I expected. From all the hype and rave reviews I’d read of Eleanor and Park, I thought the book was a light and quirky love story — nope. 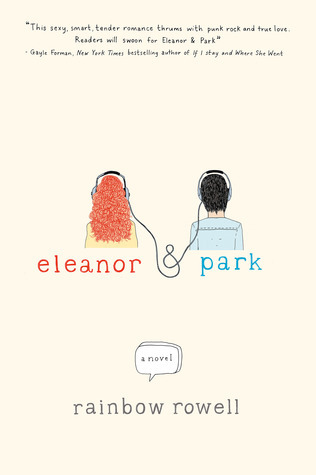 Eleanor and Park have completely different families and lives, but their meeting on a bus (definitely not a stereotypical love-at-first-sight meeting) throws them into each other’s path. Eleanor and Park’s alternating perspectives give the book a sense of balance. Park might be an outcast for being Korean, but that’s not the end of the story. While Park has a loving (though imperfect) family and a upper-middle class upbringing, Eleanor lives in poverty with her struggling family and abusive stepfather. The stark contrast between Eleanor’s life and Park’s is a strong reminder that oppression and privilege come in many different forms. To be honest, the sudden jump from tentative friendship to full-on romance was almost jarring. I felt that the emotional intensity of Eleanor and Park’s relationship inexplicable and a bit too much. (Then again, I find most romantic expressions trite, so I might just be a cranky cynic.) But, when I read the book in the context of Park’s comment about Romeo and Juliet, I found myself almost believing in Eleanor and Park’s grand and star-crossed love. Rainbow Rowell’s post Why is Park Korean? Ellen Oh: What’s your opinion on Eleanor & Park?